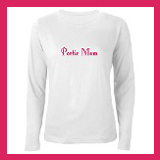 Sasha and Malia, if you're still looking for a Mother's Day gift for your awesome mom, it's not to late to order her this Portie Mom T-shirt. It's perfect for gardening, early morning dog walks, and soccar games. And it comes in this sunny yellow color that I know she likes since it is reminiscent of her saffron yellow inauguration day ensemble. Click here to order this style. Or visit my store for more colors and options. A Portie Mom hoodie would be super cute too. And Happy Mother's Day, Mrs. Obama. You are doing a terrific job as Mom-in-Chief! The iconic image that captured the day when President Barack Obama met his First Dog, Bo. Available at my online store in men's, women's, plus, kid's, and infant sizes. Click here to see lots more sizes, styles, and colors. Is Charlie Obama Change To Believe In? Porties for Change by Moira McLaughlin, 2009. Now that the identity of the Obamas' new dog has been confirmed. Some interesting details about the Fist Dog's original name and litter mates have also surfaced. We now know that Charlie Obama is arriving Tuesday and will be presented as a gift by Senator Edward Kennedy. We know Charlie will be renamed by the Obama girls, and that he and Kennedy's dog, Cappy, are from the same Amigo Portuguese Water Dog litter. The pups' parents are Ch. Amigo's Phor What Its Worth AKA Penny and his father is Ch. Valkyrie's Dr. Watson Is Here AKA Watson. I wonder which one is Charlie? Inspired by the rumor in Portie circles that Charlie Obama was born Change To Believe In, I designed these t-shirts. They are available in men's, women's, plus, children's and kid's sizes here. 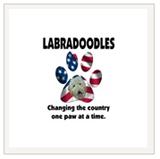 Visit my online store to see all my Portie designs and lots of other dog breed products too.